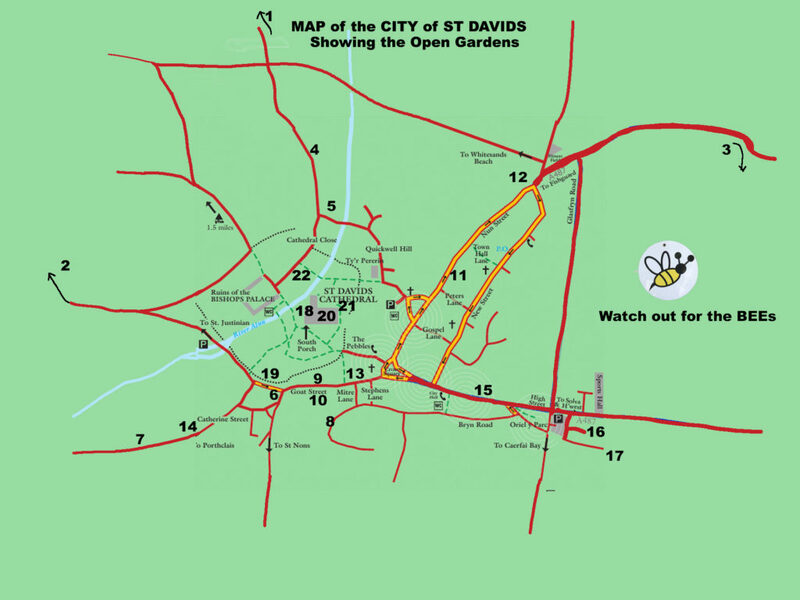 St Davids is officially recognised as a Bee Friendly City. You can see the details of the gardens on the website under “Our Gardens”. Enjoy your explorations and the lovely people you will meet in our beautiful City. 1. Jan & John Warren, Ty Uchaf, Treleddyd Fawr. Difficult to find but well worth it if you persist. Dogs welcome on leads as there are animals about. 2. Samantha Minas, Belle’s Field Slightly out of town along the St Justinian’s Road. You will need stout shoes as the ground is uneven but mostly flat.Well behaved dogs on leads welcome. We have plenty of car parking, but this is a fantastic garden to include as part of a circular walk to Porth Clais and Clegyr Boia. 4. Penrhiw Priory, Retreats Group SA62 6PG Penrhiw Priory includes a woodland walk which is accessible but includes a number of steps and uneven path in places. 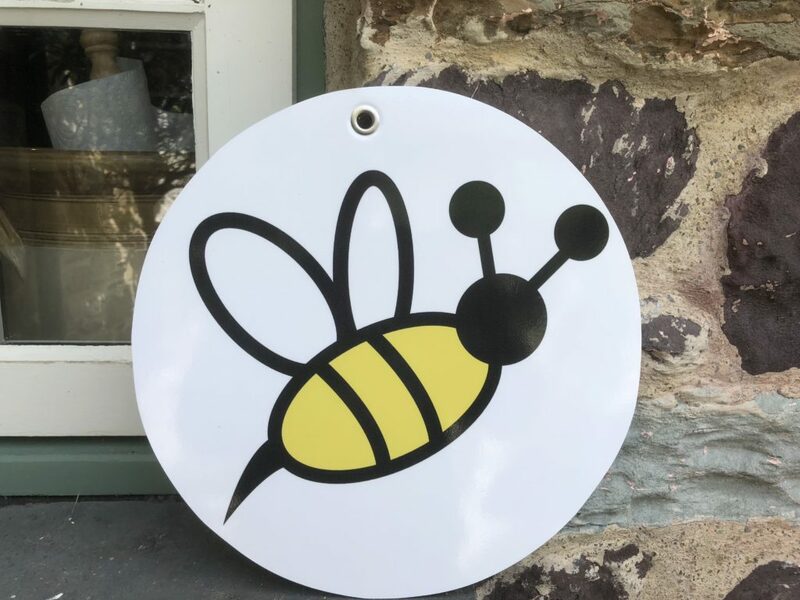 Parking for Penrhiw is available in the meadow, which is through a gateway on the right hand side, approximately 50 metres past Penrhiw Priory’s main entrance. There are some steps and uneven paths. Dogs are welcome in our grounds, on a lead. 5. Jenny Tripp Black, MBE and Gordon Black, Melin Dan Y Rhiw. Wear comfortable walking shoes and, if wet, wellington boots! Beware of the bees. 6. Lisa and Chris Sayner, 44 Goat Street Some steps to negotiate. Dogs on leads welcome as there are resident animals. 7. Francis and Melanie Northall, Catherine Street. The ground is slightly uneven and there are steps here and there. 8. Deborah John, 2 Ffordd Owen Well behaved dogs on leads are welcome but we have two resident cats and one resident dog. Wheelchair access on the sloping garden may be a problem. 9. Amanda and Dan Wright, Goat Street Gallery. We do have 3 steps in our garden which might make it difficult for the disabled. We do have a good view of the garden from the gallery. Access to the garden is through the gallery which means that NO dogs are allowed. There is a dog ring outside the gallery. 10. John & Julia Mansfield, Old Carpenters, 33 Goat Street We have gravel paths and some stone stone steps in the top garden, plus a flight of steps up from the yard which will make this garden inaccessible to some. Well behaved dogs on leads are welcome but NO dogs in the Soap Shed please. 11.Caroline and Pete Williamson, Prospect House, 60, Nun Street We do have steps up to the rear garden and also dogs must be on lead. 12. Heather and David Gifford, 101 Nun Street. The garden is unsuitable for dogs and some of the paths are unsuitable for those with mobility problems. 13. Liz and Mike Hodson, 12 Goat Street The garden is flat, with no steps, it has an all-weather path and lawn with stepping stones and some large visible roots. 14. Rod and Annie Haig, Glanalan, Catherine Street This garden is suitable for dogs on leads only. The garden is also very tricky for pushchairs or wheelchairs. 15. Sue & Gareth Preece, 47 High Street. Well behaved dogs on a lead are welcome. Access – 3 steps up to the rear garden but can also be viewed from a narrow path that runs alongside the house. One very shallow step down to the front garden but can also be viewed over the walls on 2 sides. 16. Joe and Maggie Rose, Garden, Bryn Haul. Well behaved dogs on leads welcome. 17. Dai and Sandra Chant, Colonial House, 4 Anchor Drive. Well behaved dogs on leads welcome. 19. Deanery Garden – The swing is for a very small child only – the tree won’t stand anything more! Dogs on leads please. Steep paths slippery when wet. 20. Cloister Garden – inside the Cathedral and unsuitable for dogs. 21. Peace Garden – dogs on leads only. 22. Treasury House Garden – dogs on leads only.